I would like to wish everyone a very Happy 4th of July. This day signifies the signing of our Declaration of Independence and the revolution that lead to this great nation. I don’t have any colonial ancestors. I don’t even have a colonial “uncle of the wife of my 6th cousin twice removed”. As yet, I have no roots in America prior to 1849. Today, I will share with you this photo that a cousin shared with me. 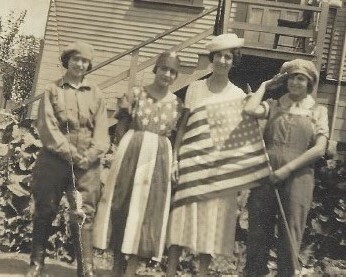 It’s from a 4th of July celebration in the 1920s in Oakland, California. The Bonita’s of Oakland, California celebrate Independence Day with their cousin from Hawaii. Shown: Sophie (Bonita) Guido, Margaret (Bonita) Moleiro, Gloria (Braga) Thom, and Rose (Bonita) Ferreira. The young women are Sophie (Bonita) Guido, Margaret (Bonita) Moleiro, Gloria (Braga) Thom, and Rose (Bonita) Ferreira. 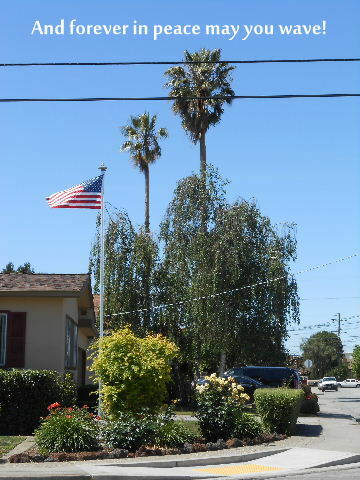 The photo was taken in front of the Bonita house in Oakland, California. Gloria was visiting from Hawaii. A ship manifest shows Gloria and her father, Seraphim de Braga, returning home to Honolulu in August 1924. Perhaps this photo was taken during that trip. I wish you all festive and safe 4th of July celebrations! Be sure to spend a little time on the history behind our celebrations. It was a remarkable time in world history. Kenneth C. Davis’s history books bring history to life. The “Don’t Know Much About…” Series is wonderful for those of refreshing our memories about American history or those who are learning it anew. I am partial to the book written for kids. It is full of facts and interesting tales and it make our history accessible. If you haven’t read these books, check them out!